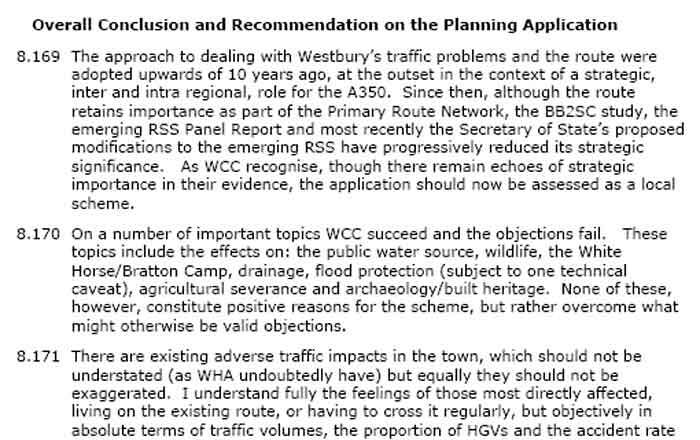 As below, the Inspector independently reached a conclusion that the eastern Westbury Bypass should be refused planning permission as its concept was out of date and the harm which it would have caused to our much loved local landscape was not justified by a minimal actual need for it. This final conclusion was decided after an Independent Public Planning Inquiry, held in Westbury from June to October 2008, where everyone had a say and all of the evidence was considered. 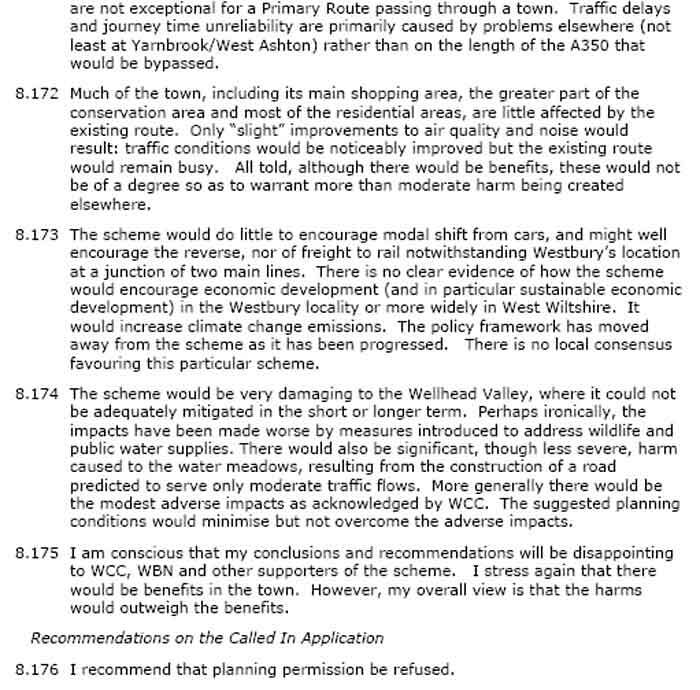 The Planning Inspector politely summarised the reasons for turning down WC's eastern bypass. Harm caused by the proposed new road would have outweighed any potential benefit. Wiltshire County Council ought to have properly considered the same balance of harms to benefits. The Inspector discounted wildlife and water concerns, but focussed upon adverse effect on landscape. So nobody can truthfully say that wildlife was being put higher than people. The inspector commented on the counterproductive visual effects of the proposed banking and gantries. HGV volume through Westbury is unexceptional, he observed. Delays and journey time unreliability are caused by problems elsewhere, at Yarnbrook & West Ashton (its fix for which too tricky WCC had dumped). The Bristol / Bath to South Coast Study, the BB2SC study referred to by the Inspector, was issued in 2004. At the following South West Regional Assembly, held at County Hall, Trowbridge, in 2004, all, including WCC, agreed that A350 improvements and any A350 Westbury Bypass would be left out of their recommendations and that HGVs would be signed to the A34 as the main north-south route. Wiltshire County Council ignored what was agreed. Wiltshire County Council produced a planning application for its eastern Westbury Bypass in 2005. The scheme was acknowledged to be unsatisfactory. Wiltshire County Council spent on insistently and worked up a further planning application, based upon similar outdated and unsound concepts, for 2007. Wiltshire County Council tried to ignore all opinion against the scheme. Conservative Wiltshire Council has now wasted about £5M of Wiltshire council tax contributions on this one all so obviously defective project.